三﹐人類的發展階段(The Developing Phases Of The Human Beings):如果与个体发育相对照. 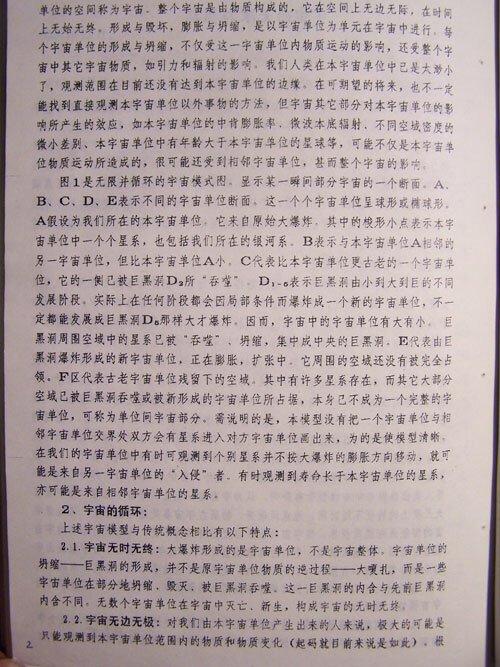 (1) 廣義而言﹕在當時的條件和認知的情況下﹐尋求最好的解決問題的方法並利用之﹐即為科學。如,中医学, 就是一个最好的例子. 先祖们将野生植物栽培成粮食, 蔬果; 将野生动物培养成家禽家畜也是很好的实证. 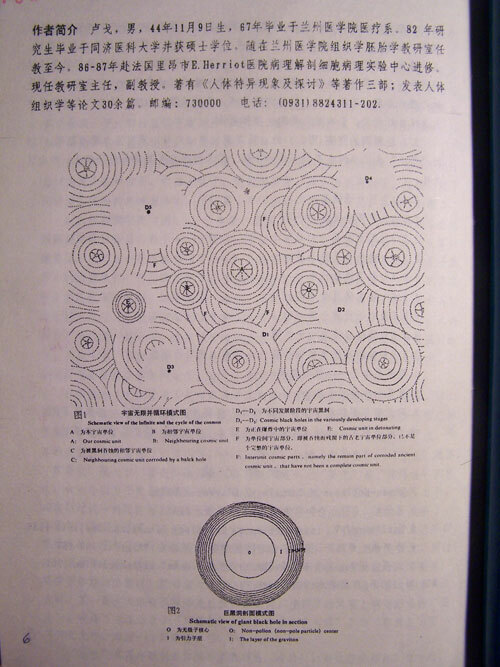 D﹐銀河系隨本星系團以每小時1百30萬英哩的速度向大吸引體 (Great Attractor) (位于半人馬座方向) 飛馳。那里也许就是本星系团的最终归宿.但在此之前, 银河系也许早已与仙女座相撞了. (1) 太陽溫度的變化;(2) 太陽黑子的變化;(3) 太陽磁場的變化;(4) 太陽風暴.这些都直接影响着地球的自然环境.从而影响着人类的生活和生存. The author puts forward an infinite and circular cosmic model. It is held that what we could observe is only one unit among the innumerable units of the cosmos which is called the Home Cosmic Unit (HCU). The HCU is formed by the Big Bang of Cosmic Unit Black Holes (CUBH). Countless cosmic units that experience different developing phases include formation from CUBH, explosion, development, maturing, licked up phase by other forming CUBH constitute the infinite and circular cosmos. The shell fragments and dust (a part of dark matter) created by the explosion of CUBH compose the nuclei of galaxies, stars or even original planets and determine their motive pattern. The center of a CUBH is a non-polon group formed by the splitting of gravitons and the repulsion source for the explosion and expansion of cosmic units which belongs to a part of dark energy. The gravitation of adjacent cosmic units to the HCU is the other part of dark energy which is the main energy for the current accelerating expansion of the HCU. (1) The cosmos is infinite: Its space carrying all the things and changes is boundless and limitless; its time describing the speed of all changes is without beginning or end. (2) The cosmos is circular: It is units of cosmic unit. Countless cosmic units that experience different developing phases include formation from CUBH, explosion, development, maturing, licked up phase by other forming CUBH constitute the infinite and circular cosmos. (3) The cosmos is itself generational and completely automatic running. The author points out the developing phases of human beings (HBs) include embryonic, infantile, preschool, youth, adult and the eternal life. Currently, HBs are just in the transition of phase from infantile to preschool. The author presents that there is a great possibility of “Gods” derived from the HCU and moreover there is not only one kind of God. The possibility of “Gods” derived from the entire cosmos is 100%. The definition of “God” is spirit that has the most excellent wisdom and masters all the laws of nature. The “Gods” can pass through time and space and create life. Evolution is the course and process while God is the result, the supreme stage of evolution. Without evolution God is rootless; without God evolution is fruitless. Human beings represent a stage of considerable importance, but, they are not the final result. This opinion could unite evolution and the Gods. The author brings forth: In addition to respecting Gods and praying for Gods’ help, human beings should learn from Gods so as to master all the laws of nature and try to reach the level of God’s wisdom and knowledge for the eternal life existence. Human beings should learn from Gods the methods to: realize society in harmony; carry out scientific research continuously; promote development of human beings and strive to master all the laws of nature. All the goals must be achieved in time so that HBs can leave the Earth before it is destroyed; leave the solar system before it is destroyed; leave the Milky Way Galaxy before it is destroyed; leave HCU before it is destroyed. Only in this way, can human beings move freely in the cosmos fending off calamities and get good luck and achieve the goal of eternal existence. Otherwise, there will no future for human beings and they will be inevitably destroyed by natural disasters. This is not the prospect for human beings. There should be remembered forever by the descendants of human beings. 2. Ge Lu. 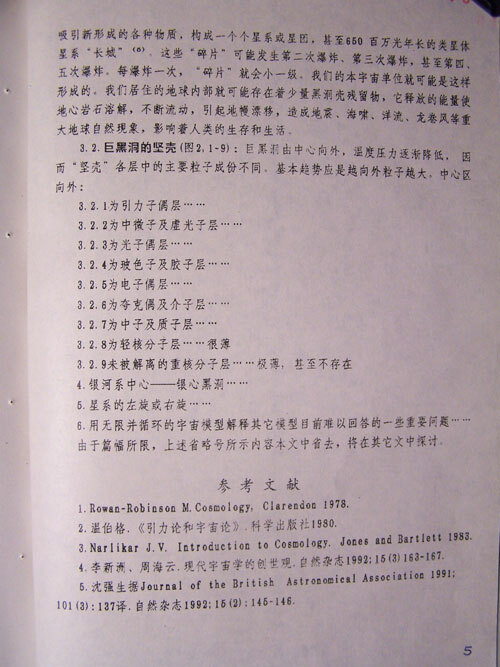 The infinite and circulation of cosmos and the past, now and future of mankind ---Analysis to cosmos and mankind by combining the viewpoint of Chinese philosophy with science as forming a whole---. Dissertation for the Degree of Doctor of Philosophy in Oriental Medicine. 2002. American Liberty University. ( in Chinese; abstract in English ). 3. Adam Frank. How an amateur astronomer changed stellar astrophysics. Astronomy, Nov. 2009 P.48-53. 4. New observation have smashed the old view of our universe. What now? Scientific American.Jan. 1999. Front cover. 5. Parallelism Theory. A screw cosmic model in mathematics. Science News. June 24 2006. Back cover. 6. Tim Folger. A universe built for us. Discover, Dec. 2008. P. 52-58. 7. Paul J. Steinhardt. Why the universe had no beginning. Astronomy, Apr. 2009. P.28-33. 8. David Castelvecchi. Galaxy clusters slide to the south. Mysterious flow could call universe’s uniformity into question. Science News. Oct. 25,2008. P.12. 9. Editor’s picks. Top 10 discoveries of the last 35 years. 4, faster than a speeding bullet. Astronomy, Aug. 2008. P.40. 10. Abraham Loeb. Going faster than the speed of light. Astronomy. Jan. 2009. P.12. 11. Michael E. Bakich. The northern sky’s top 10 galaxies. 5. The Needle Galaxy ( NGC 4565 ).Astronomy, Nov. 2008. P.60. 12. Simon Dedeo. Big Bang vs. Black Holes. Astronomy, Dec. 2006. P.62. 13. Editors’ picks. Top 10 discoveries of the last 35 years. 9. An attraction of massive proportions.The Great Attractor. Astronomy, Aug. 2008. P.37. 14. Chris Schur. Globular cluster NGC 6712. Astronomy, Dec. 2008. P.85. 15.Jan Ambjorn, Jerzy Jurkiewicz and Renate Loll. The Self-Organizing Quantum Universe.Scientific American, Jul. 2008. P.42-49. 16.Timothy Clifton and Pedro G. Ferreira. Does Dark Energy Really Exist? Scientific American,Apr. 2009. P.48-55. 17. David Biello. Dark Matter Discovery. Scientific American. Nov. 2006. P 36. 18. Kathryn Garfield. Did life begin in space? Discover. Nov. 2006. P.16. 19. Liz Kruesi. Colliding galaxies have shocking good time. Astronomy. Nov.2009. P.23. 20. Liz Kruesi. What do we really know about dark matter? Astronomy. Nov.2009. P.30-31. 21. Ken Freeman, Geoff McNamaro. “ In Search of Dark Metter “. Praxis Publishing. 2006. P.136. 22. Micheal S. Turner. Origin of the universe, Scientific American. Sep. 2009. P.36-43. 23. Ron Cowen. Heavyweights spotted in the early universe. New found massive galaxies may force theorists to revisit leading formation model. Science News. Apr. 25, 2009. P.5-6. 24. Ron Cowen. Beyond Galileo’s universe. Science News. May 23, 2009. P.22-28. 26. Hubble Site. Spitzer and Hubble Team up to Find “ Big Baby “ Galaxies in the Newborn Universe. Release Images Sep. 27, 2005. 27. NASA Hubble Space Telescope Collection. Astronomers Find One of the Youngest and Brightest Galaxies in the Early Universe ( Abell 1689-zD1 ). Release Date: Feb. 12, 2008. 28. Physics Department of Stanford University. The Fundamental Particle Diagram. 29. Editor. How does gravity bends light in space? Science Illustrated. May/June 2009. P.28. 30. Liz Kruesi, Roen Kelly. Light’s dual personality. Is light a wave or a particle? Science says both. Astronomy. July 2009. P.34-35. 31. Roen Kelly. Sensing gravity waves. Astronomy. Sep. 2008. P.24. 32. Michael Klesius. Neutrino Observatory. National Geographic. Oct. 2006. P.22. 33. Ron Cowen. New Solar System. Science News. Aug. 19, 2006. P.115. 35. Josh Faber. When galaxies merge their central black holes combining to form a single, more massive black hole. Astronomy. July 2009. p.45. 36. D.P. Milky Way disarmed. Astronomy. Sep.2008. P.21. 37. Henoy Hsieh. Are comets and asteroids the same thing? The Solar System. 2008. P.80-85. 38. David J. McComas. Can we send a spacecraft to the sun? Astronomy. Dec.2006. P.42-47. 39. James Trefil and Wando O’Brien-Trefil. What can neutrinos tell us about the universe? Astronomy. Dec. 2009. P.31-35. 40. Francis Reddy. Pluto gets the boot! Astronomy. Dec. 2006. P.78-79. 41. L. K. Baby stars found at galactic center. Astronomy. Oct. 2009. P.22. 42. Francis Reddy. New Spitzer mosaic unveils galaxy’s heart. Astronomy. Sep. 2008. P.18. 43. Ron Cowen. Giant black holes in nearby galaxies may be more massive than thought. Science News. July 4, 2009. P.5-6. 44. Liz Kruesi. Will dark energy tear the universe apart? Science News. July 4, 2009. P.5-6. 45. Editor picks. Top 10 stories of 2008. 5, Fermi blasts off: This all-sky view. Astronomy. Jan. 2009. P.34-35. 46. Liz Kruesi. How we mapped the Milky Way. Astronomy. Oct.2009. P.28-29. 47. Glenn Chaple. Cruise the Milky Way. Astronomy. Sep. 2009. P.70. 48. Robert Benjamin. How astronomers glimpse the naked galaxy. Astronomy. 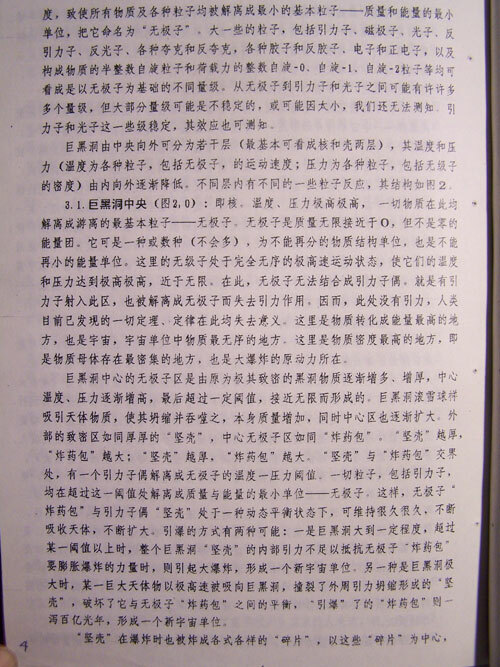 Feb. 2007 P.58-63. 49. Bruce dorminey. The stars that revealed the vastness of the universe. The dwarf galaxy I Zwicky 18. Astronomy. Sep. 2009.P.48-53. 50. Tony and Daphne Hallas. The Cigar Galaxy (M 82 active galaxy). Astronomy. Nov. 2008. p.61. 52. R. T. Twisting the night away. (Arp 194). Astronomy. Aug. 2009. P.21. 53. Ed Fomelont, Ron Ekers, Wil Van Breugel ,Kate Ebneler and J. M. Uson. Extended lobes of radio emission NGC 1316. Astronomy. Feb. 2009. P.54. 54. Robert Benjamin. Why are galaxies so bright? Sombrero Galaxy (M 104). Astronomy. Sep. 2009. P.54. 55. David J. Eicher. The Hercules cluster and M 83 ( R.Jay GaBany. Spiral galaxy M 83 ). Astronomy. Seo. 2009. P.79. 56. Tony Hallas. The Andromeda Galaxy (M 31). Astronomy. Sep. 2009. P58-59. 57. Al Kelly. Face-on spiral galaxy NGC 3184. Astronomy. Sep. 2009. P.63. 58. John Vickery and Jim Matthes. The Whale Galaxy (NGC 4631) in Canes Venatici Travels through space. Astronomy. Nov. 2008. P.61. 59. Donald Stewart. The heart of the Whirlpool Galaxy. The Planetary Report. May/June 2009. 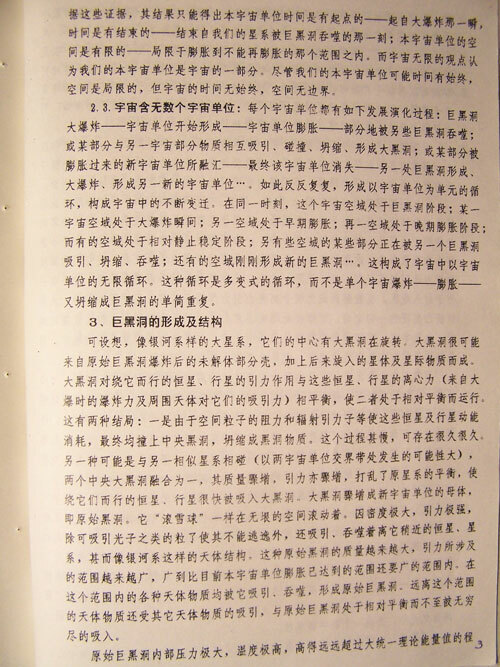 P.13. 60. Stephen J. O’Meara. Take the Ghost Hunt Challenge. R.Jay GaBany. Ghost Hunt #14. Astronomy. Oct. 2009. P.57. 61. Rogelio B. Andreo. This wide-field view ( the Orion, The Hunter ). Astronomy. Sep. 2009. P.57. 62. Steve Coe. Explore forgotten. Scorpius. Astronomy. June 2007. P.60-63. 63. Andreas B’Ker and Axel Martin. The Large Magellanic Cloud. Astronomy. Sep. 2009. P.33. 64. Ryan M. Hannahoe. The Ela Carinae Nebula ( NGC 3372 ). Astronomy. Sep. 2009. p.64. 65. Raymont Shubinski. All about the Horsehead Nebula. The Dark Cloud Barnard ( B 68 ). Astronomy. Dec. 2006. P.66-71. 66. Michael E. Bakich. What is a Bok globule? Astronomy. Sep. 2008. P.59. 67. Don Taylor. The Baby Nebula ( IC 1848 ). Astronomy. Sep. 2009. P.65. 68. Daniel B. Phillips. The Running Man Nebula ( NGC 1973-5-7 ). Astronomy. Sep. 2009. P.65. 70. Adam Block. The Trifid Nebula ( M 20 ). Astronomy. Dec. 2009. P.70. 71. Adam Block. The Orion Nebula ( M 42 ). Astronomy. Dec. 2009. P.47. 72. Mario Livio. Hubble’s Top 10. 6th Supermassive Black Holes Galore ( Plasma Jet ). Scientific American. July 2006. P.47. 73. Ron Cowen. Giant black holes in nearby galaxies may be more massive than thought. Galactic Black Hole Mass vs. Bulge Mass. Science News. July 4, 2009. P.5-6. 74. L. K. Black hole jets observed in new light. Astronomy. Aug. 2009. P.21. 75. L. K. Astronomers identify--- Black hole twins. Astronomy. Jun. 2009. P.20. 76. Robert Mera. Giant disk of cold gas and dust fuels possible black hole at the core of NGC 4261. The Planetary Report. May/June 2009. P.16. 77. Jean-Pierre Lasota. Unmasking Black Holes. Scientific American. May 1999. P.44. 78. Abraham Loeb. The Dark Ages of the Universe. Scientific American. Nov. 2006. P.46-53. 79. Mario Livio. Hubble Top 10. 10th. The accelerating universe. Scientific American. July 2006. P.49. 80. Mario Livio. Hubble Top 10. 8th. The edge of space. Scientific American. July 2006. P.48. 81. Stephen J. O’meara. The Christmas Cross: A matter of life and death. Astronomy. Dec. 2009. P.58-59. 82. Richard Talcott. Hubble ‘s grand new vistas. Astronomy. Dec. 2009. P.24-29. 83. Bill and Sally Fletcher. The constellation Orion. Astronomy. Dec. 2009. P.72. 85. Rick Blair. Planetary Society Members Salute the Hubble Space telescope. The Planetary Report. May/June 2009. P.12. 86. Daniel B. Phillips. IC 1287. Astronomy. Dec. 2009. P.69. 87. NASA/ESA/Hubble Heritage Team. Bright stars hide heart of darkness. Astronomy. Feb. 2009. P.10-11. 88. Daniel C. Good. Dark Nebula Barnard 86. Astronomy. Feb. 2007. P.95. 89. Origins of a Revolution in Hardcover. Science Illustrated. Nov/Dec. 2009. P.40-43. 91. Sid Perkins. Step-by-step Evolution. Science News.Jan.31,2009. P.30. 92. Tina Hesman Saey. Evidence of recent evolution. Science News. Jan.31,2009. P. 29. 93. David M. Kingsley. From Atoms to Trails. Scientific American. Jan. 2009. P.52-59. 94. Roen Kelly. The universe’s expansion. Astronomy. July 2010. P.34. 95. David C. Catling and Kevin J. Zahnle. The Planetary Air Leak. Scientific American. May 2009. P.36-43. 96. Bill Cooke. Why is the Moon’s orbital distance increasing over time? Astronomy. June 2007. P.65. 97. How fast are moving in the universe? Science ILLUSTRATED. Mar/Apr. 2008. P30. 98. Avery E. Broderick and Abraham Loeb. Portrait of a Black Hole. Scientific American. Dec. 2009. P.42-49. 99. Editors’ picks. Top 10 stories of 2008. (9) Seeing the cosmos’ dark flow. Astronomy. Jan. 2009. P.31. 100. Roen Kelly. How big are black holes? Astronomy. Jan. 2009. P.63. 101. Editor’s picks. Top 10 discoveries of the last 35 years. (5) Black Holes---really. Astronomy. Aug. 2008. P.40. 102. Steve Nadis. How we could see another universe. Astronomy. June 2009. P.26-29. 103. Adam Frank. How astronomers cracked the Einstein code. Astronomy. Sep. 2008. P.22-27. 104. Sten Odenwald. The coming solar superstorm. Astronomy. Sep.2008. P.34-39. 105. F. R. Black holes wind up galaxy arms. Astronomy. Sep. 2008. P.19. 106. Daniel Verschatse. The Antennae ( NGC 4038 and NGC 4039 ). Astronomy. Nov. 2009. P.57. 107. Alan Goldstein. Watch as galaxies collide. Astronomy. Nov. 2009. P.56-59. 108. John Herschel. The colliding spiral galaxy. NGC 2207 and IC 2163. Astronomy. Nov. 2009. P.57. 109. Filippo Ciferri. In our accelerating universe, the Milky Way could separate from distant galaxies like M 100 at a rate exceeding light-speed. Astronomy. Jan. 2009. P.12. 110. James Trefil and Wanda O’Brien-Trefil. The day Earth come to life. Astronomy. Sep. 2009. P.24-29. 111. Robert Zimmerman. What makes Mira tick? Astronomy. Feb. 2007. P.42-47. 112. France Reddy and Dana Berry. When planets stray. Astronomy. Feb. 2007. P.66-69. 113. Ray Jayawardhana. What revved up the galaxy’s hyperfast stars? Astronomy. Sep. 2009. P.30-35. 114. Francis Reddy. The supernova next door. Astronomy. June 2007. P.32-37. 115. Liz Kruesi. Colliding galaxies have shocking good time. Astronomy. Nov. 2009. P.23. 116. Liz Kruesi. What do we really know about dark matter? Astronomy. Nov. 2009. P.28-33. 117. Ray Villard. Hubble’s top 5 science discoveries. (4) The universe’s expansion rate nailed down. Astronomy. July 2010. P.30-35. 118. Bruce Dorminey. What galaxy superclusters tell us about the universe? Astronomy. Jan. 2010. P.28-33. 119. Space Telescope triumphs: Hubble’s top 5 science discovers. (1) Galaxies evolved from smaller structures; (2) Supermassive black holes are common in galaxies; (3) Dark energy exists; (4) The universe’s expansion rate nailed down: 74.3 km/sec/Mpc < 5%; (5) Sampling the atmospheres of extrasolar planets. Astronomy. July 2010. P.30-35. 120. Tamara M. Davis. Is the universe leaking energy? Scientific American. July 2010. P.38-47. 121. Charles H. Lineweaver and Tamara M. Davis. Misconceptions about the Big Bang. Scientific American. March 2005. P.36-45. 122. Stephen Hawking will now take your questions. 10 questions. Time. Nov. 15, 2010. P.8. 123. Michael D. Lemonick. Let There Be Light. Time. Sep. 4,2006. P.42-51. 124. Christen Brownlee. Nurture Takes The Spotlight. ---Decoding the environment’s role in development and disease. Science News. June 24,2006. P.392-393*396. 125. Charles Petit. Ultramassive: As Big as it gets. Science News. Oct.25.2008. P.18-23. 126. Laura Sanders. Scientists gain helical spin control. Science News. Apr.25.2009. P.12. 127. Solmaz Barazesh. Viruses could power devices. Science News. Apr.25.2009. P.12. 128. Tom Siegfried. A New View of Gravity. Science News. Sep.5.2010. P.26-29. 129. Susan Gaidos. Starting anew. Science News. Feb.13.2010. P.22-26. 130. Phil Plait. Why size matter. Discover. Dec. 2010. P.58-62. 131. Corey Powell. Discover 50 best brains in science 2008. Discover. Dec. 2008. P.28-51. 132. Glowing Jellyfish. The secret lives of cells. Science Illustrated. Mar/Apr.2008. P.72-77. 133. Kip S. Thorne. Black Holes & Time Warps. W.W. Norton & Company 1994. 134. Kip S. Thorne. Black Holes & Time Warps. W.W.Norton & Company. 1994. 135. Watch Tower Bible and Tract Society of Pennsylvania International Bible Students Association.Life---How did it get here? By evolution or by creation? 1984. 136. Patrick Moore and Fred Watson. Astronomica. Millennium House. Australia. 2007. 137. Stephen Hawking & Leonard Mlodinow. A Briefer History of Time. Bantam Dell. A Division of Random House, Inc. New York. U.S.A. 2005. 138.Ken Freeman & Geoff McNamara. In Search of Dark Matter. 2006 Praxis Publishing Ltd. Germany. 139.Jean-Louis Heudier & Charles Frankel. The Night Sky. Firefly Books Ltd. 2004. 140. Lars Lindberg Christensen, Bob Fosbury & Martin Kornmesser. Hubble --- 15 years of Discovery. NASA/ESA. 2005. 141. Linda K. Glover & A.Chaikin, P.S. Daniels, A. Gianopoulos, J.T. Malay and B. Aldrin. National Geographic Encyclopedia of Space. National Geographic. Washington D.C. 2005. 142. Fulvio Melia. The Edge of Infinity. Supermassive Black Holes in the Universe. Cambridge. 2003. 143. Martin Rees. Universe. Dorling Kindersley Limited Publishing Inc. New York. USA. 2005. 144. Roger Penrose. The Road to Reality. A Complete Guide To The Laws Of The Universe. Random House, Inc., New York. 2005. 145. Seth Lloyd. Programming The Universe. A quantum computer scientist Take on the cosmos. Alfred A. Knopf. New York. 2006. 146. Leonard Susskind. The Black Hole War. My battle with Stephen Hawking to make the world safe for quantum mechanics. Little, Brown and Company. Hachette Book Group USA. 2008. 147. Marcia Bartusiak. Archives of the Universe. A treasury of astronomy’s historic works of discovery. Pantheon Books, New York. 11/2004. 148. Karl F. Kuhn and Theo Koupelis. In Quest Of The Universe. 4th Edition. Jones and Bartlett Publishers, Inc. USA. 2004. 149. Robin Kerrod. Hubble, The mirror on the universe. Firefly Books Ltd., Manufactured in Singapore by Pica Digital Pte Ltd. Printed in China. 2004. 150. David DeVorkin and Robert W. Smith. Hubble: Imaging Space And Time. National Geographic Society. Washington, D.C. USA. Printed in China. 2008. 151. Heather Couper. Universe. Stunning satellite imagery from outer space. Thunder Bay Press. San Diego, CA. USA. Printed in China.2006. 152. Carole Stott, Robert Dinwiddie, David Hughes and Giles Sparrow. Space from earth to the edge of the universe. Dorling Kindersley Limited. 2010. Printed in China. 153. National Geographic Society. The Science Book. Peter Delius Verlag GmbH & Co. KG. Berlin. 2008. Printed In China. 154. 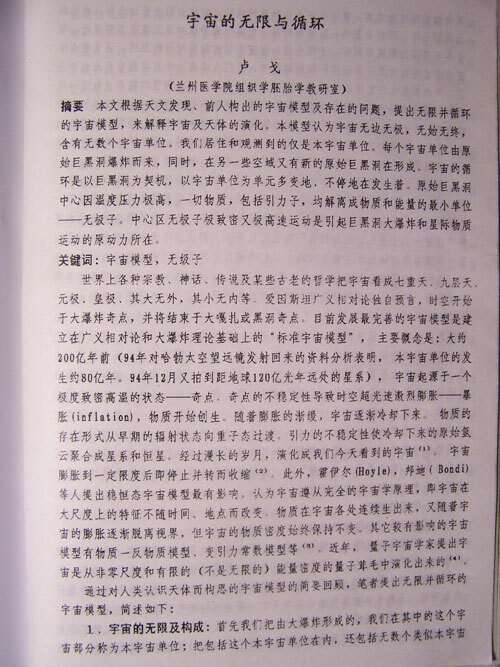 卢戈 ，宇宙的无限与循环，《 飞碟探索 》 1995； 89； 10-12. 158. 史蒂芬 霍金，列纳德 蒙洛迪诺：时间简史。吴忠超译。湖南科学技术出版社 2005.